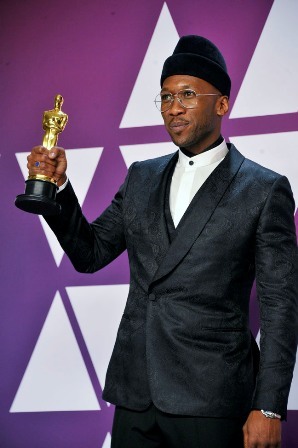 Speaking backstage after winning an Oscar win for his supporting role in “Green Book,” Mahershala Ali said tonight it was the first time he felt such responsibility for a film. As a central character in a two-man story, Ali was required to be on set nearly every day throughout the shoot. And the man he portrayed, classical jazz concert pianist Don Shirley, was very different than Ali. Though Ali won two years ago for his supporting role in another best-picture winner, “Moonlight,” he said he doesn’t take the statuette for granted. “It makes me more aware of all the people who have really contributed to my life,” the actor said, from his childhood to the team now working on his behalf. He said there have been many other milestones since his first win. “My life has changed tremendously in two years. My daughter just had her 2nd birthday two days ago,” Ali said. His goal now is just to be as productive as possible.